Last week, we announced that margarine may become a thing of the past with butter dominating the market. This week, butter wins again. Well, a different kind of butter. All the Olive Garden loyalists and dessert lovers out there, we'd like you to meet the chain's newest offering: the Cookie Butter Cake. The mouth-watering dessert combines crumbled cookies, creamy sweet butter, two layers of light vanilla cake and a warm caramel drizzle. "We wanted to create a flavor of comfort and crave-ability," Jessica Dinon, an Olive Garden rep told TODAY. "What more says comfort than cookie butter in cake form?" According to Jessica, one of the treat's first testers, it passes the crave test: "I had it yesterday and I'm going to have it again tomorrow. It's amazing." For those who aren't yet acquainted with the phenomenon that is cookie butter, it is basically just ground-up speculoos cookies blended with powdered sugar and vegetable oil. The spreadable treat has been a staple in Scandinavia for years, but it only gained celeb status in the U.S. about two years ago — largely thanks to Trader Joe's version. Since the cookie butter shortage, however, the dessert community has come up with creative new ways to savor that addictive sweet. Only one jar left? TODAY added it to ice cream to make it last and stuffed it in a truffle to make it count. And now, Olive Garden is turning our beloved cookie butter into cake. 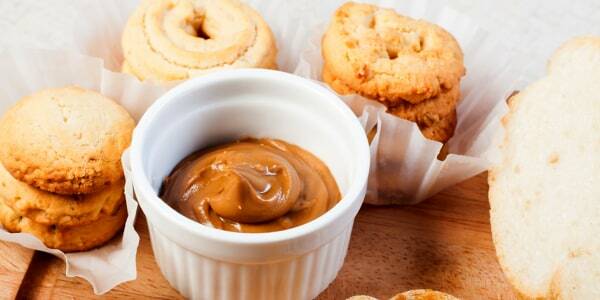 The cookie butter invention might offend dessert purists who believe in separating their treats. But Olive Garden's new flavor combo, like the cotton candy milkshake, the crookie and the McFlurry sandwich, proves that, when it comes to sweets, less is not more. The Cookie Butter Cake hits all Olive Garden menus on Monday, July 31. If you're anything like Jessica, you'll be back for more by Wednesday.